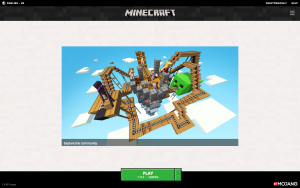 The Minecraft username, also known as a Minecraft.net username, is the username you would have chosen for your game account when you purchased it for the computer. You can look at that account as kind of like a robot, if you will. You purchased your game account (robot) and you gave it a name (Minecraft username). That account has a UUID associated with it that allows it to access servers. The name you gave your Minecraft account is the name we need on our enrollment forms, as it is attached to the UUID that will allow your student access to our server. If we do not have the correct name upon enrollment, it will delay your student's ability to properly start their course. To find this username, open your Minecraft game launcher and: On the old game launcher, before clicking PLAY, look to the right where it says, "Welcome, Username". That name is the name we need for your student's enrollment. If you have the new launcher you would see this: The username will be located in the top right corner and on the green PLAY button. Since the ability to change Minecraft usernames became available in 2015, account holders are capable of changing their usernames every 30 days via Minecraft.net. We have had many students change their names with and without parental permission and find that they lose access to our server and/or end up with missing grades because of this. Due to the complexity of our grading system, the importance of maintaining accurate records, and the necessity of delivering proper grading to our families, it is not recommended that any student change their Minecraft.net username while currently enrolled in a session. Between sessions is the best time to change their name, should they desire, and we can update it on their enrollment forms before classes start, for free. Should your student change their username and need to be updated in our system after the start of classes, a $7.95 charge will be billed to the parent on the account in order to update our system. Please be sure to discuss this with your student before their class starts. If a Minecraft.net username is changed and you have lost access to our servers, please email us at info@GamEDAcademy.com for instructions.